From left to right: Lee Whitely, Jake Lea, and David Montague. On Sunday, July 29th, Downeast Lakes Land Trust held its Annual Meeting and Picnic on the shores of West Grand Lake. Coupled with a benefit auction, this annual event also marks the announcement of the Downeast Lakes Conservation Award. This year’s recipient is longtime DLLT supporter and volunteer, John “Jake” Lea. 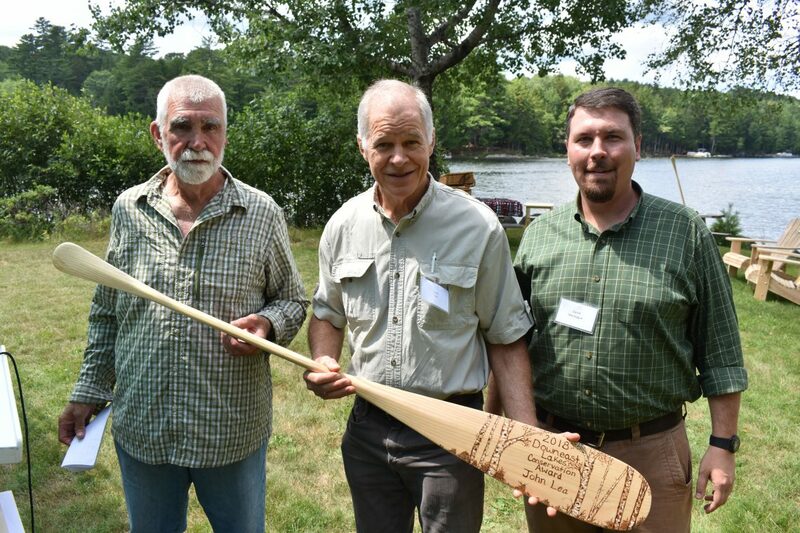 This annual award was created to honor those who have made extraordinary contributions toward the economic and environmental well-being of the Downeast Lakes region. Jake has lifelong ties to the Grand Lake Stream area and has been an instrumental force for the work of DLLT since its inception in 2001. 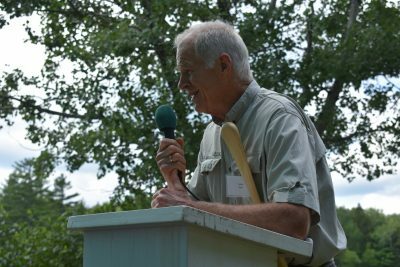 He first served as the Downeast Lakes Forestry Partnership (DLFP) leadership committee chair, which led to the conservation of more than 340,000 acres in the region and the DLLT purchase of 27,000 acres for the creation of what would become the Downeast Lakes Community Forest. Jake played a key role in negotiating and guiding this partnership between DLLT and the New England Forestry Foundation, which raised more than $30 million dollars for conservation in our region. After the success of the DLFP, Jake served on the fundraising committee for the subsequent Wabassus Lake Project and co chaired the West Grand Lake Community Forest Project. To view a list of past recipients of the Downeast Lakes Conservation Award, please click here. For more information, please contact DLLT at (207) 796-2100, or email info@downeastlakes.org.